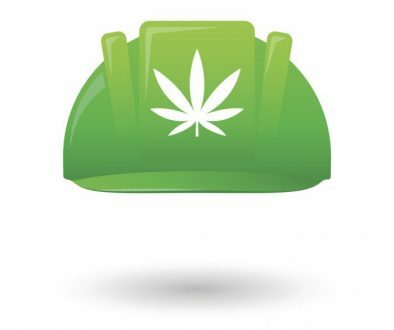 By Max Porterfield, Callinex Mines Inc.
With its stated mission of discovering and developing deposits within established Canadian mining districts, Callinex Mines (TSX-V: CNX), headquartered in Vancouver, BC, is enjoying the fruits of its labours. The company had its origins in the 2011 split of Callinan Mines, which dates back to 1927, into Callinan Royalties and the Callinex entity that holds the exploration portfolio today. In 2014, the company renewed its exploration focus on zinc and copper-rich massive sulphide deposits. Two years later, during a period where zinc prices hovered near five-year lows, the company acquired a portfolio of zinc assets in eastern Canada. Overall, Callinex’s zinc resources within established Canadian mining jurisdictions total 712 million pounds of zinc equivalents (Zn Eq.) contained within 9.0 Mt averaging 3.6% Zn Eq. in the Indicated Mineral Resources category and 2.3 billion pounds of Zn Eq. contained within 18.4 Mt averaging 5.7% Zn Eq. in the Inferred Mineral Resources category. In 2017, the company completed nearly 20,000 meters of diamond drilling within its zinc-rich project portfolio, marking its busiest year in its history. Callinex aggressively moved forward its advanced-stage assets in the Bathurst Mining District supported by the robust zinc market, where the price rose by 29 per cent in 2017, further building on a 60 per cent increase from 2016. 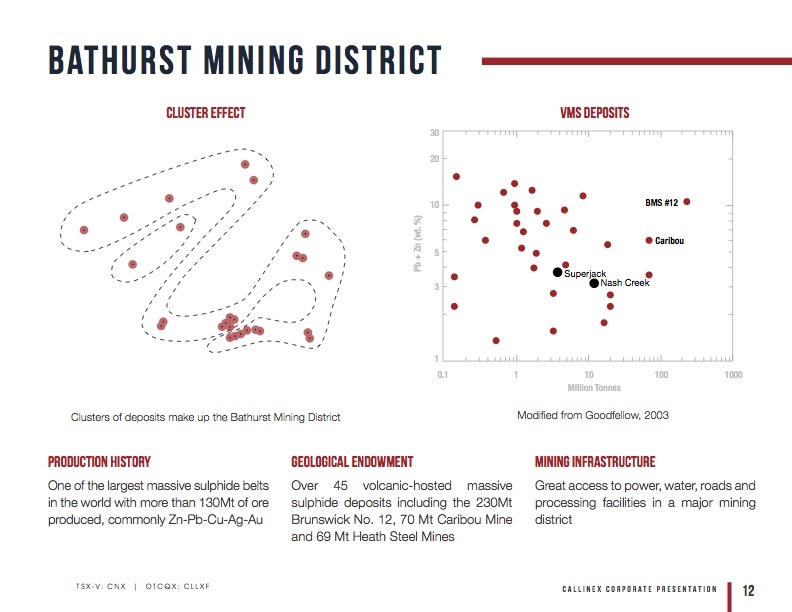 Bathurst is one of the largest volcanogenic massive sulphide (VMS) districts in the world with deposits totaling more than 500 million tonnes. 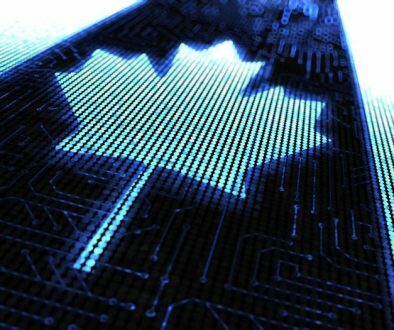 (There exist 350 deposits and major VMS occurrences in Canada; Bathurst and Flin Flon are the two top jurisdictions in the nation.) More than 130 million tonnes have been produced since 1950, commonly lead-zinc-silver deposits. The district houses an extensive infrastructure, including railway, highway, deep water port, multiple mill sites and smelter. Callinex is fortunate to own one of the largest unmined deposits in the district located one kilometre from a major highway and transmission line. One company milestone in 2017 was the completion of a maiden drilling campaign at the Nash Creek Project, which culminated with the major expansion of the Nash Creek Deposit to the north. The success of this program led to an expanded drilling campaign that concluded just before the holiday season. While the company awaited results from the most recent campaign, which consisted of 35 holes, the deposit remained open for continued expansion in the new year. The most recent round of drilling was completed to expand the deposit up to 700 meters north of the mineral resource, which exists over a 1.4 km strike length. Work completed by Callinex this past year has demonstrated that the Nash Creek Deposit is materially larger than when the company first acquired it. While Callinex’s initial focus has been to continue to expand the deposit to the north, it believes there is strong exploration potential in all directions. Additionally, the Central Zone, located 1.6 kilometers to the east where historic drilling has intersected zinc mineralization in widely space drill holes, could host a significant resource with additional drilling. Based upon initial exploration success at the Nash Creek Deposit, Callinex has aggressively expanded the land package to nearly 10,000 hectares to effectively control an entire prospective zinc-rich VMS belt. 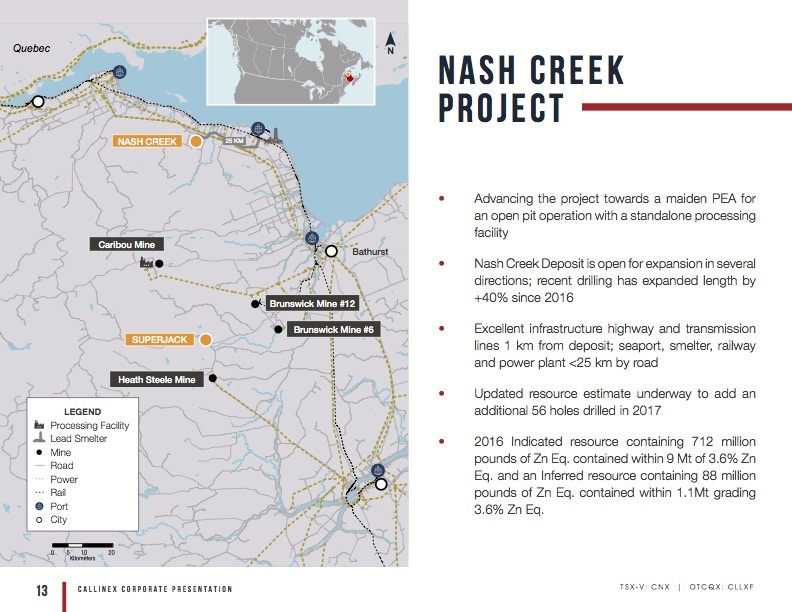 The Nash Creek Project now covers several high-grade zinc occurrences over a 20-kilometer-long trend within the same geologic setting that hosts the Nash Creek Deposit. This highly prospective land package has had very little exploration work completed and represents an exciting opportunity for Callinex to discover additional zinc-rich deposits in 2018 and beyond. 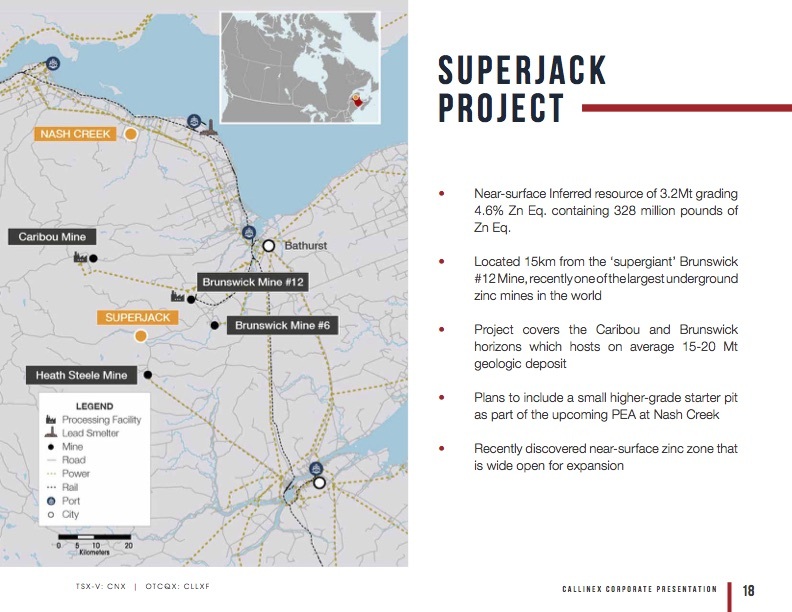 While Callinex has advanced exploration at the Nash Creek Project, it has concurrently commenced development studies to further investigate the economic potential of the Nash Creek and Superjack Deposits. The work in 2017 was focused toward a robust Preliminary Economic Assessment (PEA) on the Nash Creek Project in the first half of 2018 that will include an economic analysis on the potential viability of the mineral resources. The PEA is anticipated to have a base-case scenario of a standalone open pit operation with potential to process between 15 to 20 million tonnes of material. On the exploration front, Callinex’s primary objective is to delineate the extent of the Nash Creek Deposit along strike in both directions, including to the north where the company anticipates expanding mineralization by up to 700 meters along strike. 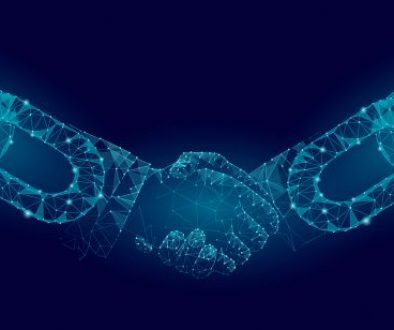 Callinex also plans to test satellite zones that are open for expansion and commence a district-scale exploration program along the 20-kilometer-long VMS belt. 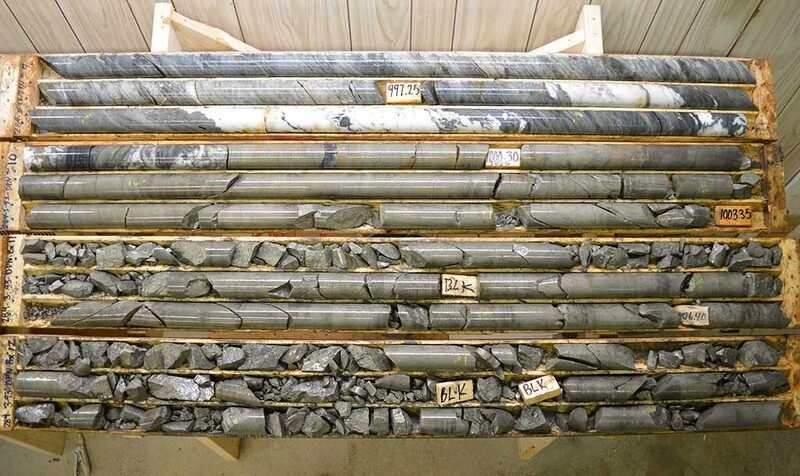 Meanwhile, a first-pass drilling campaign at the Superjack Project demonstrated the exploration potential of the project when two of the first six holes intersected a new, near-surface zinc deposit known as the D Zone. The company has since completed a 43-kilometer ground electromagnetic survey that identified untested conductors. Additional drilling will be required to evaluate the size and extent of the new D Zone and test conductors along strike from mineralization. Callinex also completed significant acquisition and exploration activities in the Flin Flon Mining District where it now controls a land package encompassing more than 100 square kilometers. 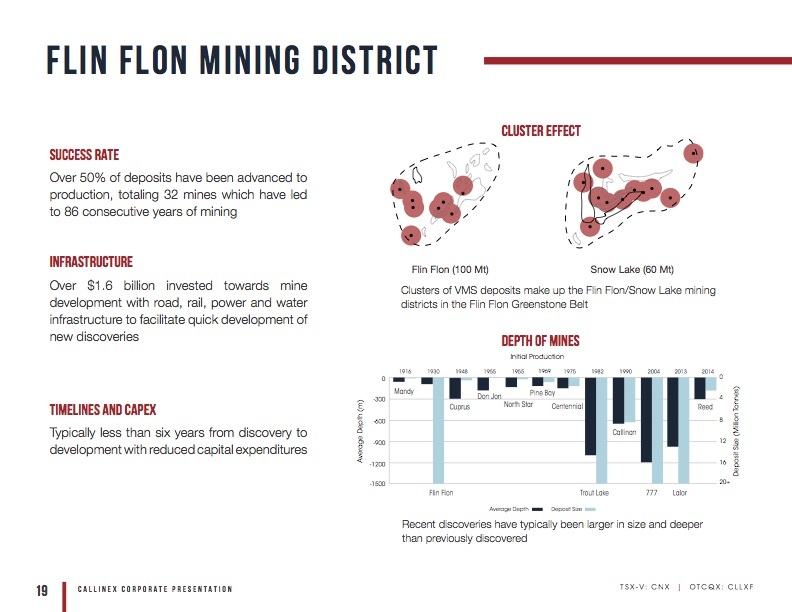 Flin Flon is another of the most significant VMS districts in the world with production totaling more than 130 million tonnes. More than 30 deposits have been mined, most of which are high-grade copper and zinc-rich deposits. Callinex’s land package is within close proximity to the operations of HudBay, which has been actively mining in the area. Notably, the company signed an option to acquire a 100 per cent interest in the Big Island Project, which hosts the high-grade Tara Lake Deposit that had not been explored in more than 20 years. Since acquiring the project, Callinex has completed an initial six-hole drill program and plans to conduct additional drilling to test targets in 2018. The company also completed additional drilling at its Pine Bay Project to follow-up on high-grade mineralization discovered at depth. The company has received significant drill results in January 2018 from drilling completed at Nash Creek that will be included in an updated resource estimate and subsequent PEA in the first half of 2018. 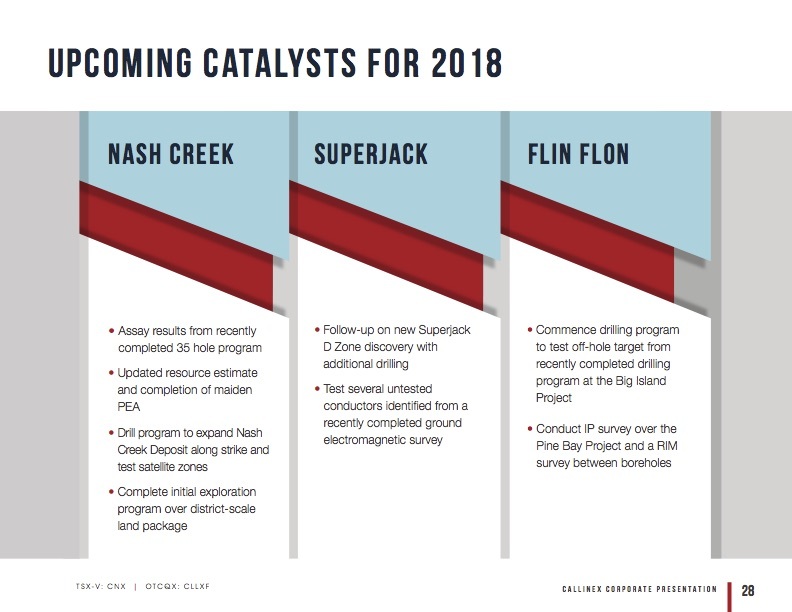 Callinex will continue to conduct advanced exploration at the Nash Creek and Superjack projects in the Bathurst Mining District and test earlier-stage targets at its Big Island, Pine Bay and Flin Flon projects in the Flin Flon Mining District. 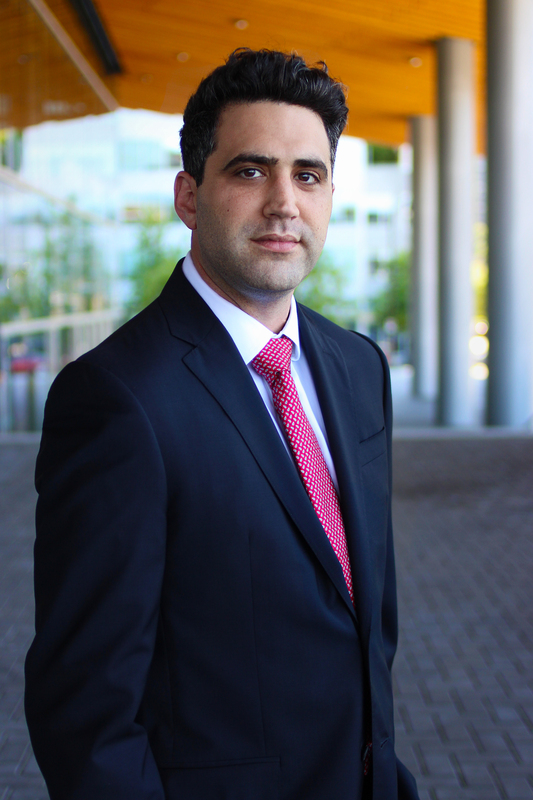 Callinex’s management is excited about the opportunities to advance its project portfolio. The year 2018 may be a transformative one for the company to evolve from an exploration-stage company to a development-stage company with a portfolio of compelling exploration opportunities. Max Porterfield is President and CEO of Callinex Mines Inc., which is advancing its portfolio of zinc-rich deposits located in established Canadian mining jurisdictions.